Today: Craving something warm? So are we. Try this deeply-satisfying, creamy chicken soup. 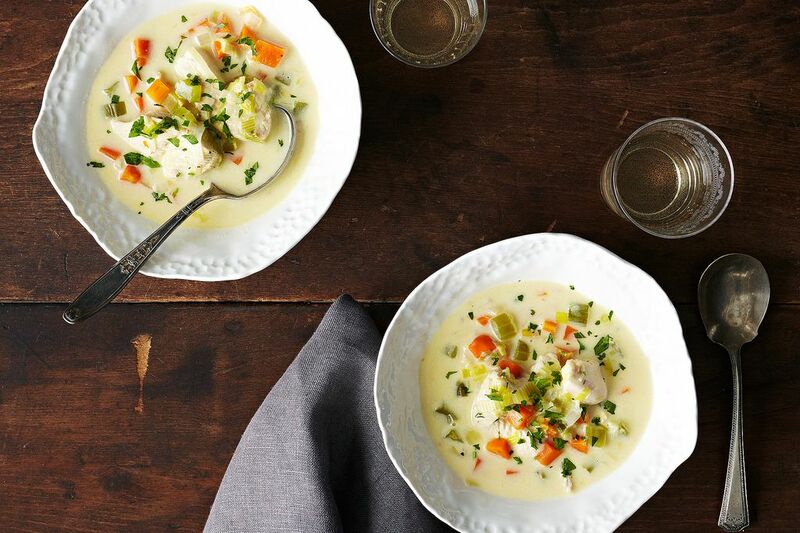 It's no secret that chicken soup is one of our favorite winter dishes, and this Belgian iteration has all the makings of a winner: It's easy to make, is chock-full of vegetables, and has a creaminess that's rewarding after a day of trekking through the cold. Originally from Ghent, a town in northern Belgium, this dish was incredibly popular in the 16th century and has stood the test of time. (While it's traditionally served with white fish, we love how easy this ingredient swap for chicken is.) Up the ante and add some potatoes or serve it with a thick slice of bread to soak up the broth from the bottom of the bowl. We'd tell you to make a double batch, but that wouldn't be necessary: The entire process takes a little over 30 minutes from start to finish, so feel free to make a fresh pot the next time you need some help defrosting from a winter chill. I made this last night and it was spectacular! Probably shouldn't have made it during Texas summer but whatever, it was still delicious. This is a wonderful soup recipe, so easy, I've made it often. I didn't think of this as an "exact" recipe, here is how I made it. Three stalks of celery, because I like it. frozen leeks, I used half the bag. I only had 3 chicken breasts on hand, so I cut them horizontally to make them thinner, simmered for about 20 minutes, pulled out the six (6) large pieces, cooled, chopped then put back in at the end. I probably used more chicken stock than recommended so I used a third tablespoon of cornstarch. I added a bay leaf and some nutmeg. My parsley looked a little tired, so it just went into the trash. 4 chicken breasts is rather vague. They come in all sizes and could weigh anywhere from 12 oz. to 2 pounds, even assuming boneless. Please edit recipes for consistent accurate information. why is it so hard to print your recipies. you' think they were copyrighted. give me a break! I'm sorry you're having trouble printing! Try this: To print, just click on the link to view the recipe (or any of the photos), then click the print button on the upper left hand corner of the recipe (the button directly to the right of the save button) - did that work for you? I don't know what Leslie does, but I only use the white part. It looks nicer in the white soup and has a more delicate flavor than the green parts. Actually this is a simple farmers recipe and people used whatever they could get at the moment. It is the cream or milk with makes this a typical waterzooi. The meaning of waterzooi is "cooking in water". Zooi is an old Dutch word, which comes from zieden (to cook). You can find it in the English word 'seethe'. Incredibly informative - thank you! Do you use the entire leek, green part as well? As Jan responded above, you can choose to do either. This recipe calls for the entire leek, but you can use the white part if you want a more subtle flavor.